Changes not driven by certain region, age or income groups. Taste, price and convenience are no longer the sole deciding factors when people buy food and beverages, according to a new study, from Deloitte, Food Marketing Institute (FMI) and Grocery Manufacturers Association (GMA). The study, "Capitalizing on the Shifting Consumer Food Value Equation," included results from a survey conducted on 5,000 consumers nationwide, as well as interviews with executives from over 40 companies across retailers, food and beverage manufacturers, ingredient suppliers and agricultural producers. 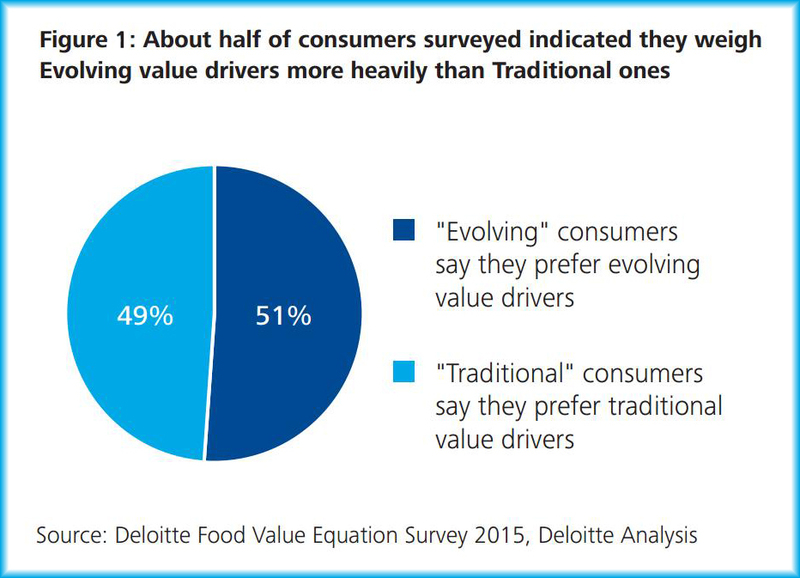 Results showed that roughly half of Americans surveyed (51%) weigh "evolving drivers" – health and wellness, safety, social impact, experience and transparency – in their purchasing decisions, in addition to the "traditional drivers" of taste, price and convenience (Figure 1). The study noted that this does not mean the Traditional drivers are no longer important. In fact, it said Traditional value drivers continue to be among the most important drivers of behavior, and likely will be for the foreseeable future. What the results mean is that the Evolving drivers in the consumer value equation join the Traditional drivers as part of the full plate of influence when considering the drivers of consumer purchase decisions and take a greater share than in the past, according to the study. Millennials are typically attributed to the changes occurring in consumer behavior; however, the study actually found that the shift towards Evolving drivers and a broader purchase consideration set was not driven by certain region, age, or income groups. The changes were pervasive across region, age and income. This means that each and every consumer targeted by food manufacturers and retailers has changed in a fundamental and impactful way, the study explained. "Contrary to conventional wisdom, it's not just the millennials or most affluent putting these evolving drivers in the mix," said Jack Ringquist, principal of Deloitte Consulting LLP and global consumer products leader. "Our research reveals that the preference for these attributes does not differ by generation, income level or region, but is pervasive across these groups. The U.S. consumer has changed in a fundamental and impactful way, and people's preferences are becoming even more fragmented than the food industry may have anticipated." The study also showed a shift in the way people think about food safety. Americans no longer define the concept of food safety based on near-term risks to their health, according to the study. Instead, nearly three-quarters (74%) of consumers in Deloitte's "2015 Consumer Food Value Equation" survey believed that a definition of food safety limited to "one that will not cause any immediate, physical, harm" is insufficient. Consumers now link health, wellness and transparency with their definition of safety, and include factors such as free from harmful ingredients (62%); clear and accurate labeling (51%); and fewer ingredients, processing and nothing artificial (42%). "Food retailers are inherently 'shopper advocates' and they respect that their customers want both genuine and transparent shopping experiences," said FMI chief collaboration officer Mark Baum. "Our study sheds light on how companies can better understand the intersection of these new consumer food values and their own growth strategies." - Market success will be determined by building purpose-driven competitive advantages. "Today's consumers have a higher thirst for knowledge than previous generations and they are putting the assessment of that information into their value equation," said Jim Flannery, senior executive vice president, operations and industry collaboration at GMA. "There is no doubt that the consumer value equation has changed – as taste, price and convenience are now only the foundation with the need to leverage the emerging value drivers. Brands that win with consumers will likely be those that provide the information they seek, well beyond what is on the label."